Flow Table for Cement Testing - This used for measuring the consistency of pozzolana and also cement mortar and hydrated lime. It consists of a machined brass table top 250+/- 2.5mm dia. Mounted on a rigid stand. The table top is reinforced with equally disposed ribs and allowed to conical brass mould 100mm i.d. top dia and 50mm high. Accessories : Mild steel plate 25mm thick and 25cm square for fixing to the underside of the base. Same as ZI 1008 but electrically operated to raise and drop the table top, approx. 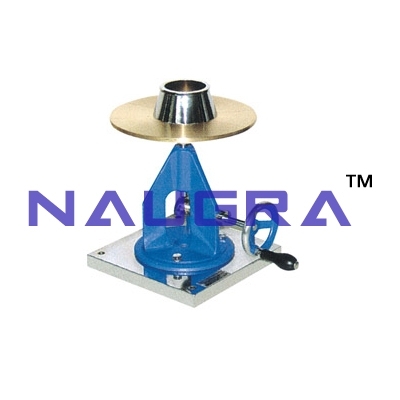 15 times in 15 seconds, Suitable for operation on 230 Volts, 50 cycles, A.C. supply..
We are leading manufacturers, suppliers & exporters of Flow Table: Used for measuring the consistency of pozzolana For Testing Lab for Cement Testing Lab. Contact us to get high quality designed Flow Table: Used for measuring the consistency of pozzolana For Testing Lab for Cement Testing Lab for schools, colleges, universities, research labs, laboratories and various industries. We accept bulk orders for government tenders in all countries around the globe.